Yes, it is anther cucumber recipe but seriously they are the fruit of the season and are so cooling for the body which is welcome this month. 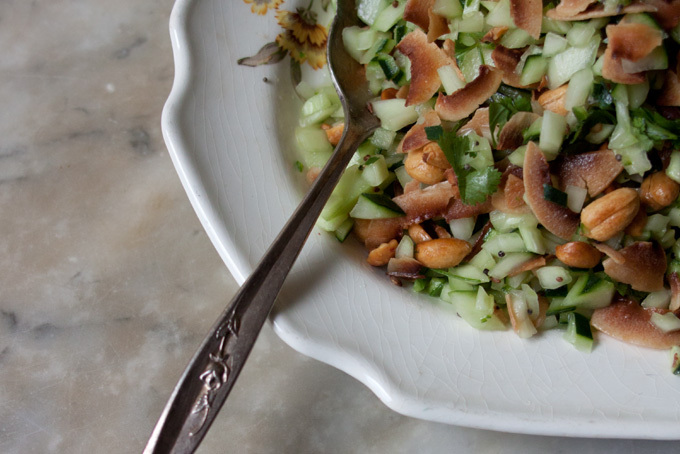 This is a salad that will bring all of your favorite tastes together in each bite; spicy, sweet, crunchy, and salty. While the ingredients for this salad can be prepped ahead you won’t want to mix them until serving time as the peanuts tend to lose their crunch. I have my daughter Kate to thank for this recipe and Heidi Swanson who featured it on her ever inspiring blog 101 Cookbooks. It’s now a summer staple.